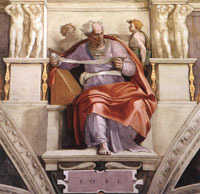 What follows is a comment upon the Sistine Chapel figure of the prophet Joel, from the following: Life and Early Works (Michelangelo: Selected Scholarship in English), by William E. Wallace. Routledge, 1995, pg. 16. "Joel is informed by a higher energy of spirit than the Delfica [Delphic Sibyls], expressing a contrast of principle that will persist throughout the ceiling between the male force of the Prophets and a lesser spiritual vigor in the Sibyls. More not only than the Delfica but than his companion Zachariah, Joel makes the spectator know that Michelangelo will henceforth speak about a new dimension of humanity. Joel's controlled energy and scale of form convey that they are the reciprocal of a state of mind: he makes the impression of a being magnified in body and spirit far above the normal status of humanity." Michelangelo Buonarroti, 1475-1564. The Prophet Joel, from Art in the Christian Tradition, a project of the Vanderbilt Divinity Library, Nashville, TN. http://diglib.library.vanderbilt.edu/act-imagelink.pl?RC=54225 [retrieved April 24, 2019]. Original source: http://commons.wikimedia.org/wiki/File:Michelangelo,_profeti,_Joel_01.jpg.